An economic system (also economic order) is a system of production, resource allocation and distribution of goods and services within a society or a given geographic area. It includes the combination of the various institutions, agencies, entities, decision-making processes and patterns of consumption that comprise the economic structure of a given community. As such, an economic system is a type of social system. The mode of production is a related concept. All economic systems have three basic questions to ask: what to produce, how to produce and in what quantities and who receives the output of production. The study of economic systems includes how these various agencies and institutions are linked to one another, how information flows between them and the social relations within the system (including property rights and the structure of management). The analysis of economic systems traditionally focused on the dichotomies and comparisons between market economies and planned economies and on the distinctions between capitalism and socialism. Subsequently, the categorization of economic systems expanded to include other topics and models that do not conform to the traditional dichotomy. Today the dominant form of economic organization at the world level is based on market-oriented mixed economies. Productive enterprises; factor and product markets; prices; population. National income, product and expenditure; money; inflation. International trade, finance, investment and aid. Consumer economics; welfare and poverty. Natural resources; energy; environment; regional studies. Political economy; legal institutions; property rights. What goods and services shall be produced and in what quantities? How shall goods and services be produced? That is, by whom and with what resources and technologies? For whom shall goods and services be produced? That is, who is to enjoy the benefits of the goods and services and how is the total product to be distributed among individuals and groups in the society? Methods of control over the factors or means of production: this may include ownership of, or property rights to, the means of production and therefore may give rise to claims to the proceeds from production. The means of production may be owned privately, by the state, by those who use them, or be held in common. A decision-making system: this determines who is eligible to make decisions over economic activities. Economic agents with decision-making powers can enter into binding contracts with one another. A coordination mechanism: this determines how information is obtained and used in decision-making. The two dominant forms of coordination are planning and markets; planning can be either decentralized or centralized, and the two coordination mechanisms are not mutually exclusive and often co-exist. An incentive system: this induces and motivates economic agents to engage in productive activities. It can be based on either material reward (compensation or self-interest) or moral suasion (for instance, social prestige or through a democratic decision-making process that binds those involved). The incentive system may encourage specialization and the division of labor. Organizational form: there are two basic forms of organization: actors and regulators. Economic actors include households, work gangs and production teams, firms, joint-ventures and cartels. Economically regulative organizations are represented by the state and market authorities; the latter may be private or public entities. A distribution system: this allocates the proceeds from productive activity, which is distributed as income among the economic organizations, individuals and groups within society, such as property owners, workers and non-workers, or the state (from taxes). A public choice mechanism for law-making, establishing rules, norms and standards and levying taxes. Usually, this is the responsibility of the state, but other means of collective decision-making are possible, such as chambers of commerce or workers’ councils. There are several basic questions that must be answered in order for an economy to run satisfactorily. The scarcity problem, for example, requires answers to basic questions, such as what to produce, how to produce it and who gets what is produced. An economic system is a way of answering these basic questions and different economic systems answer them differently. Many different objectives may be seen as desirable for an economy, like efficiency, growth, liberty and equality. Economic systems are commonly segmented by their property rights regime for the means of production and by their dominant resource allocation mechanism. Economies that combine private ownership with market allocation are called "market capitalism" and economies that combine private ownership with economic planning are labelled "command capitalism" or dirigisme. Likewise, systems that mix public or cooperative ownership of the means of production with economic planning are called "socialist planned economies" and systems that combine public or cooperative ownership with markets are called "market socialism". Some perspectives build upon this basic nomenclature to take other variables into account, such as class processes within an economy. This leads some economists to categorize, for example, the Soviet Union's economy as state capitalism based on the analysis that the working class was exploited by the party leadership. Instead of looking at nominal ownership, this perspective takes into account the organizational form within economic enterprises. In a capitalist economic system, production is carried out for private profit and decisions regarding investment and allocation of factor inputs are determined by business owners in factor markets. The means of production are primarily owned by private enterprises and decisions regarding production and investment are determined by private owners in capital markets. Capitalist systems range from laissez-faire, with minimal government regulation and state enterprise, to regulated and social market systems, with the aims of ameliorating market failures (see economic intervention) or supplementing the private marketplace with social policies to promote equal opportunities (see welfare state), respectively. In socialist economic systems (socialism), production for use is carried out; decisions regarding the use of the means of production are adjusted to satisfy economic demand; and investment is determined through economic planning procedures. There is a wide range of proposed planning procedures and ownership structures for socialist systems, with the common feature among them being the social ownership of the means of production. This might take the form of public ownership by all of the society, or ownership cooperatively by their employees. A socialist economic system that features social ownership, but that it is based on the process of capital accumulation and utilization of capital markets for the allocation of capital goods between socially-owned enterprises falls under the subcategory of market socialism. Corporatism refers to economic tripartite involving negotiations between business, labor and state interest groups to establish economic policy, or more generally to assigning people to political groups based on their occupational affiliation. Capitalism generally features the private ownership of the means of production (capital) and a market economy for coordination. Corporate capitalism refers to a capitalist marketplace characterized by the dominance of hierarchical, bureaucratic corporations. Mercantilism was the dominant model in Western Europe from the 16th to 18th century. This encouraged imperialism and colonialism until economic and political changes resulted in global decolonization. Modern capitalism has favored free trade to take advantages of increased efficiency due to national comparative advantage and economies of scale in a larger, more universal market. Some critics[who?] have applied the term neo-colonialism to the power imbalance between multi-national corporations operating in a free market vs. seemingly impoverished people in developing countries. There is no precise definition of a "mixed economy". Theoretically, it may refer to an economic system that combines one of three characteristics: public and private ownership of industry, market-based allocation with economic planning, or free markets with state interventionism. 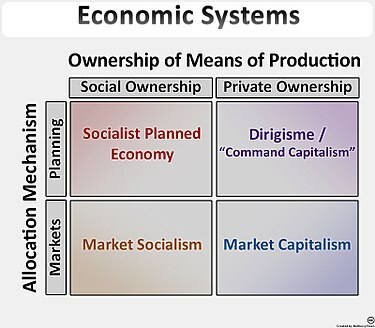 Socialist economic systems (all of which feature social ownership of the means of production) can be subdivided by their coordinating mechanism (planning and markets) into planned socialist and market socialist systems. Additionally, socialism can be divided based on their property structures between those that are based on public ownership, worker or consumer cooperatives and common ownership (i.e. non-ownership). Communism is a hypothetical stage of socialist development articulated by Karl Marx as "second stage socialism" in Critique of the Gotha Program, whereby the economic output is distributed based on need and not simply on the basis of labor contribution. The original conception of socialism involved the substitution of money as a unit of calculation and monetary prices as a whole with calculation in kind (or a valuation based on natural units), with business and financial decisions replaced by engineering and technical criteria for managing the economy. Fundamentally, this meant that socialism would operate under different economic dynamics than those of capitalism and the price system. Later models of socialism developed by neoclassical economists (most notably Oskar Lange and Abba Lerner) were based on the use of notional prices derived from a trial-and-error approach to achieve market clearing prices on the part of a planning agency. These models of socialism were called "market socialism" because they included a role for markets, money and prices. The primary emphasis of socialist planned economies is to coordinate production to produce economic output to directly satisfy economic demand as opposed to the indirect mechanism of the profit system where satisfying needs is subordinate to the pursuit of profit; and to advance the productive forces of the economy in a more efficient manner while being immune to the perceived systemic inefficiencies (cyclical processes) and crisis of overproduction so that production would be subject to the needs of society as opposed to being ordered around capital accumulation. In a pure socialist planned economy that involves different processes of resource allocation, production and means of quantifying value, the use of money would be replaced with a different measure of value and accounting tool that would embody more accurate information about an object or resource. In practice, the economic system of the former Soviet Union and Eastern Bloc operated as a command economy, featuring a combination of state-owned enterprises and central planning using the material balances method. The extent to which these economic systems achieved socialism or represented a viable alternative to capitalism is subject to debate. In orthodox Marxism, the mode of production is tantamount to the subject of this article, determining with a superstructure of relations the entirety of a given culture or stage of human development. Karl Marx's theory of economic development was based on the premise of evolving economic systems. Specifically, in his view over the course of history superior economic systems would replace inferior ones. "Inferior" systems were beset by "internal contradictions" and "inefficiencies" that make them "impossible" to survive over the long term. In Marx's scheme, feudalism was replaced by capitalism, which would eventually be superseded by socialism. Joseph Schumpeter had an evolutionary conception of economic development, but unlike Marx he de-emphasized the role of class struggle in contributing to qualitative change in the economic mode of production. In subsequent world history, communist states run according to Marxist–Leninist ideologies have either collapsed or gradually reformed their centrally-planned economies toward market-based economies, for example with perestroika and the dissolution of the Soviet Union, Chinese economic reform and Đổi Mới in Vietnam. Mainstream evolutionary economics continues to study economic change in modern times. There has also been renewed interest in understanding economic systems as evolutionary systems in the emerging field of complexity economics. An economic system can be considered a part of the social system and hierarchically equal to the law system, political system, cultural and so on. There is often a strong correlation between certain ideologies, political systems and certain economic systems (for example, consider the meanings of the term "communism"). Many economic systems overlap each other in various areas (for example, the term "mixed economy" can be argued to include elements from various systems). There are also various mutually exclusive hierarchical categorizations. ^ Daniel J. Cantor, Juliet B. Schor, Tunnel Vision: Labor, the World Economy, and Central America, South End Press, 1987, p. 21: "By economic system or economic order, we mean the principles, laws, institutions, and understandings by which international business is conducted." ^ Gregory and Stuart, Paul and Robert (February 28, 2013). The Global Economy and its Economic Systems. South-Western College Pub. p. 30. ISBN 978-1285055350. Economic system – A set of institutions for decision making and for the implementation of decisions concerning production, income, and consumption within a given geographic area. ^ Rosser, Mariana V. and J Barkley Jr. (July 23, 2003). Comparative Economics in a Transforming World Economy. MIT Press. p. 1. ISBN 978-0262182348. Chapter 1 presents definitions and basic examples of the categories used in this book: tradition, market, and command for allocative mechanisms and capitalism and socialism for ownership systems. ^ • Paul A. Samuelson and William D. Nordhaus (2004). Economics, McGraw-Hill, Glossary of Terms, "Mixed economy"; ch. 1, (section) Market, Command, and Mixed Economies. • Alan V. Deardorff (2006). Glossary of International Economics, Mixed economy. ^ David W. Conklin (1991), Comparative Economic Systems, University of Calgary Press, p.1. ^ Rosser, Mariana V. and J Barkley Jr. (July 23, 2003). Comparative Economics in a Transforming World Economy. MIT Press. p. 8. ISBN 978-0262182348. This leads us to describe two extreme categories: market capitalism and command socialism. But this simple dichotomization raises the possibility of “cross forms,”, namely, market socialism and command capitalism. Although less common than the previous two, both have existed. ^ Rosser, Mariana V. and J Barkley Jr. (July 23, 2003). Comparative Economics in a Transforming World Economy. MIT Press. p. 8. ISBN 978-0262182348. Indeed, aside from the variation of ownership forms, some follow certain ideas in Marx, saying that how one class relates to another is the crucial matter rather than specifically who owns what, with true socialism involving a lack of exploitation of one class by another. This kind of argument can lead to the position that the Soviet Union was not really socialist but a form of state capitalism in which the government leaders exploited the workers. ^ Bockman, Johanna (2011). Markets in the name of Socialism: The Left-Wing origins of Neoliberalism. Stanford University Press. p. 20. ISBN 978-0-8047-7566-3. According to nineteenth-century socialist views, socialism would function without capitalist economic categories – such as money, prices, interest, profits and rent – and thus would function according to laws other than those described by current economic science. While some socialists recognized the need for money and prices at least during the transition from capitalism to socialism, socialists more commonly believed that the socialist economy would soon administratively mobilize the economy in physical units without the use of prices or money. ^ Socialism: Still Impossible After All These Years, on Mises.org. Retrieved February 15, 2010, from Mises.org http://mises.org/journals/scholar/Boettke.pdf, What Socialism means: " The ultimate end of socialism was the 'end of history', in which perfect social harmony would permanently be established. Social harmony was to be achieved by the abolition of exploitation, the transcendence of alienation, and above all, the transformation of society from the 'kingdom of necessity' to the 'kingdom of freedom.' How would such a world be achieved? The socialists informed us that by rationalizing production and thus advancing material production beyond the bounds reachable under capitalism, socialism would usher mankind into a post-scarcity world." ^ Socialism and Calculation, on worldsocialism.org. Retrieved February 15, 2010, from worldsocialism.org: http://www.worldsocialism.org/spgb/overview/calculation.pdf: "Although money, and so monetary calculation, will disappear in socialism this does not mean that there will no longer be any need to make choices, evaluations and calculations...Wealth will be produced and distributed in its natural form of useful things, of objects that can serve to satisfy some human need or other. Not being produced for sale on a market, items of wealth will not acquire an exchange-value in addition to their use-value. In socialism their value, in the normal non-economic sense of the word, will not be their selling price nor the time needed to produce them but their usefulness. It is for this that they will be appreciated, evaluated, wanted. . . and produced." ^ "What was the USSR? Part I: Trotsky and state capitalism". Libcom.org. 2005-04-09. Retrieved 2014-08-15. 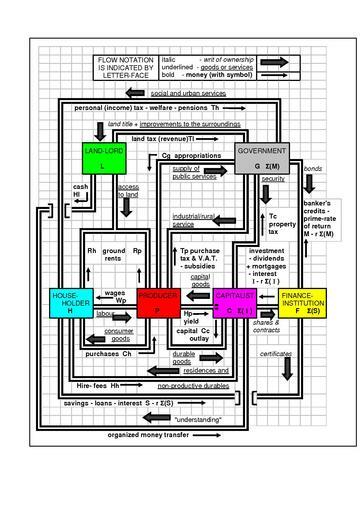 ^ Comparing Economic Systems in the Twenty-First Century, 2003, by Gregory and Stuart. ISBN 0-618-26181-8. Richard Bonney (1995), Economic Systems and State Finance, 680 pp. David W. Conklin (1991), Comparative Economic Systems, Cambridge University Press, 427 pp. George Sylvester Counts (1970), Bolshevism, Fascism, and Capitalism: An Account of the Three Economic Systems. Robert L. Heilbroner and Peter J. Boettke (2007). "Economic Systems". The New Encyclopædia Britannica, v. 17, pp. 908–915. Harold Glenn Moulton, Financial Organization and the Economic System, 515 pp. Jacques Jacobus Polak (2003), An International Economic System, 179 pp. Frederic L. Pryor (1996), Economic Evolution and Structure: 384 pp. Frederic L. Pryor (2005), Economic Systems of Foraging, Agricultural, and Industrial Societies, 332 pp. Graeme Snooks (1999), Global Transition: A General Theory, PalgraveMacmillan, 395 pp. "Video Overview of Economic Systems" by Thinkwell. "Economic Systems", a refereed journal for the analysis of market and non-market solution by Elsevier since 2001. "Economic Systems" by WebEc, 2007.